MoKo Case for All-New Amazon Fire HD 8 Tablet (7th/8th Generation, 2017/2018 Release) - Slim Folding Stand Cover for Fire HD 8, BLACK (with Auto Wake / Sleep). Automatically wakes or puts Fire HD 8 (ONLY compatible with 7th and 8th Generation, 2017 and 2018 Release) to sleep when the lid is opened and closed. Easy access to all features and controls. 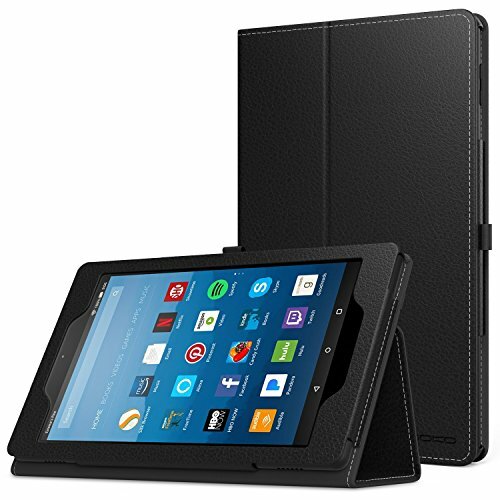 Custom designed for your precious All-New Amazon Fire HD 8 2017 & 2018 Tablet, this MoKo case features a combination of functionality and style.